001 a photo by c_27 on Flickr. Gaps in a conversation and pauses are two different things! Sometimes you can allow one person to talk for a long period of time like a monlouge. 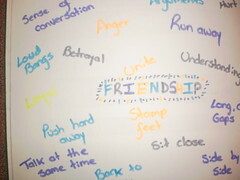 Many friendships begin akwardly, become closer, have the potential to fall apart and the potential to get closer.